I remember when I was about 12 deciding I wouldn't have a Christmas stocking any more as I was too old. I was miserable on Christmas day watching my two younger sisters dive into theirs. I soon changed my mind. I couldn't agree more, Shanna. Happy Easter! 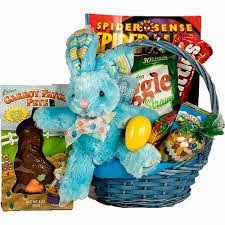 Ginny, this was a fun post and here's your excuse for needing to buy Easter candy -- it's a tradition that you need to carry on so you won't be out of practice when you have grandkids. At least that's my excuse, and I'm sticking to it! Ginny, we need every excuse we can get to buy chocolate! So yes, don't stop creating Easter baskets! I'll be in NYC this Easter Sunday - and have to admit that I haven't even thought about hiding chocolate eggs there. Probably my teenager will get her goodies in another form this year! Have a wonderful Easter in New York, Beate! I'm sure that trip will be the best treat of all for your daughter. My kids are 5 and 10, so I'm still having fun doing Easter baskets and hiding eggs. I loved hosting and attending Easter egg hunts with my kids. Enjoy your little ones and the season!